← Fixture Congestion – An Unnecessary Problem? Alan Jessup-Peacock returns after a short time away to update us on happenings at his beloved Concord Rangers. Apologies for the time away, but I’ve been moving recently and it’s taken my attention away from writing/typing! Plenty of stuff going on though around Thames Road at the moment and not all great either. First off I would like to wish Beachboys striker Harry Elmes all the best and a speedy recovery after his leg break vs. Thurrock. I was at the game, and although it was scrappy there didn’t seem to be any issues during the first half. But early in the second half the Thurrock number 3 put in a very dangerous challenge which snapped Harrys leg. It was sickening stuff; we could here the noise at the end of the ground. Thankfully the Concord Physio was on hand sharpish and the Paramedics turned up in good time to see to him. The game was abandoned shortly afterwards, and understandably so as it was obvious players were shaken up. A collection took place at the home game vs. Lowestoft the following Tuesday and raised well over £500 for Harry, which was fantastic to see, other teams have donated money & our neighbours Canvey Island have said they’ll have a collection for Harry at our next match on Easter Monday. It’s encouraging to see the football family come together and look out for Harry in this way. My thoughts are with him and along with every Beachboy fan I wish him all the best in his recovery. On to Cup news, and since my last time of writing Concord have taken part in both their cup semi-final matches. The first was at home to Grays in the Essex Senior Cup, which finished 0-2 at the end of the 90 minutes. To be honest the Beachboys never really looked like scoring, it wasn’t the best performance from the lads and I think afterwards they all knew it. Yes it was disappointing to see, but with how well the lads are doing in the league I was glad a less than stellar performance was in a cup game rather than the league! The second semi-final was again at home, this time to Hastings, who Concord had beaten 4-0 a short while before at Thames Road in the league. The match report (written by myself) is on the Concord site so I won’t go into too much detail, but the Beachboys put on a very solid display to win 3-0, although it was made difficult towards the end after fog appeared and surrounded the Aspect Arena! This set up the Ryman Isthmian League Cup final vs. Dulwich Hamlet, which will take place at Maidstone FC on Tuesday 9th April (19:30 kick off). More exciting news has come from the club over the past few days, with a new signing and the announcement that the club has put together an academy programme for young players. Full details of the Academy can be found on the Beachboys website, but it looks to be a great opportunity for young players to improve their footballing ability and continue in their education without having to travel to Southend, Basildon or even further afield as some do. You never know, it could end up being a great production line for first team players over the coming years. The new signing was announced late Monday night, with Leon McKenzie joining Concord Rangers from AFC Hornchurch. He made his Beachboy debut Tuesday night in the 1-0 win away at Enfield, and will be looking to make his home debut against Wingate & Finchley. Plenty more things to talk about down Thames Road, captain Tony Stokes picked up a knock on Tuesday against Enfield Town & will be out for at least a game, possibly more. Danny Cowley has said he’s looking to strengthen the squad going forward, which is understandable with the injury situation at present and the sheer amount of games the lads have coming up. Oh and there was a guest announcer last week at Thames Road when Concord hosted Lowestoft Town, well for the first half anyway. Can’t remember the guys name, but he did a decent-ish job for his first time, the regular guy may have to watch his job! 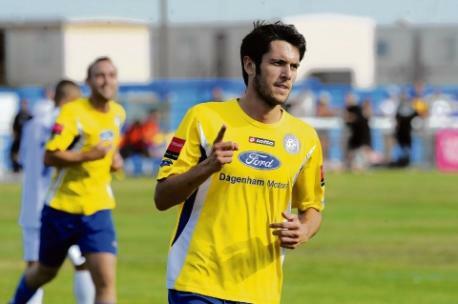 Posted on March 7, 2013, in UTL Archive and tagged Concord Rangers, Harry Elmes, Isthmian League, Ryman Premier. Bookmark the permalink. Leave a comment.